I am almost certain that every city has its own pockets of gems. When in comes to home decor you can stumble upon great thrift, antique and even amazing consignment shops, but the biggest secret is knowing where to look or should I say, where NOT to look. One of the most important things about decorating a sophisticated home on a budget is retraining yourself from purchasing products that are popular trendy. The best way to find the best stuff is to shop the off beaten path...often. When I was driving around my area a few years ago, I noticed there was a church thrift store nestled in a decent sized warehouse. A few years later they moved and another church thrift moved into the same location. Although they carried the typical thrift store type items and some hidden gems, such as THIS PIECE I found for my best friend, they also carried fabric. When they first started carrying fabric it was just a few bolts on one wall. When I came back in a few weeks ago, the store manager mentioned their supplier dropped off a truck load of fabric and told them they had 8 more whenever they sold down. Although this was random, this very same thing happened at another thrift store that sold a back stock of Ralph Lauren Wallpaper for $1 a roll! 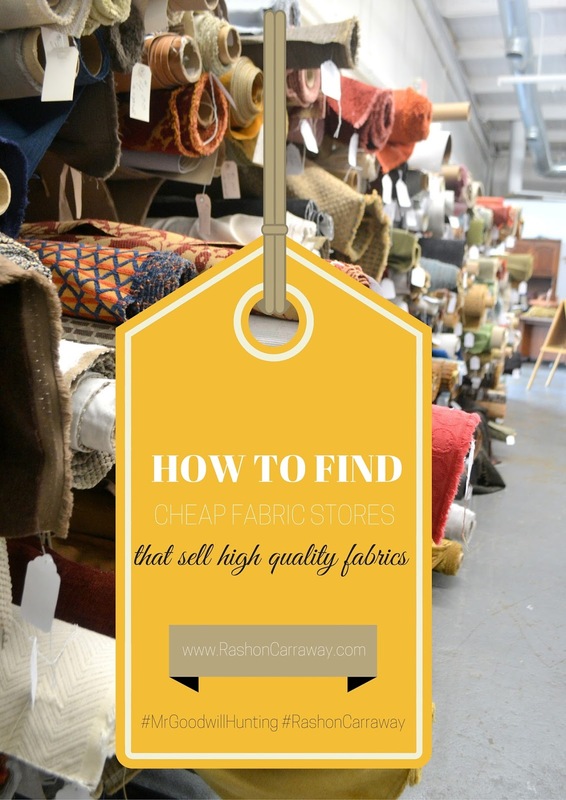 So I am going to give you a few tips on how I found a hidden fabric store. Among many things, older people know quality. How many times have you seen a stampede of the wise shoppers at Ikea? Very rarely. Older people tend to gravitate towards quality pieces. The only way to find out what second hand or fabric stores they shop at is to simply ask. I was in Goodwill and I spotted some black and white plates and a random mother (same age as my mom) just started talking to me about where she donates all of her goods and stuff. We spent the next 15 minutes just shooting the breeze. In that amount of time, I managed to find out what stores she donated to, when she shops there as well as why she donates to these stores. Which leads into tip # 2. A lot of well established churches offer a number classes that teach a number of trade services. While I was shopping and talking to the co manager of a mom-and-pop thrift store, she mentioned to me that her church taught upholstery classes. Since the classes were free, the fabric was donated and where does such donated fabric come from? Well I would assume from a mill. The south is home to a number of old mill towns and factories and a number of them still operate. Now the only way to get this type of donation, I would assume, would be to know someone who has a connection to one of these mills and guess who has these connections? You guessed it, the older consumers. Crazy thought, but one of the best things to do is ask about another place while in a similar place. Now dont go ask the employees, because they will give the same response, which is, "I really don't know of any other stores besides, JoAnns or Hancock Fabrics" The truth is, they may not know. Interesting story is that there was a lady working at the cutting counter and Hancock Fabrics and a customers was asking her what type of thread she should could for some fabric after a few exchanges, the employee revealed she didn't know how to sew. lol. Well, that was a major let down. So while you are in a fabric store, just strike up a random conversation (about sewing projects) and slowly ease into it asking about local fabric stores. I promise you this will work. It may take a few times, but keep at it if you are an avid crafter. Just as there are speciality fabric stores aside from the major retail stores there are also small shops that don't go through red tape to deliver inventory. As you can see from some of the previous photos, this particular fabric store has everything from Nate Berkus Fabric, to brocade fabric, to velvets and so much more. Yes all of these of upholstery fabric, but there is so much to choose from. I picked up several pieces of fabric to decorate my apartment for the Valentine's Holiday as well as for the Spring and I cant wait to show it to you!